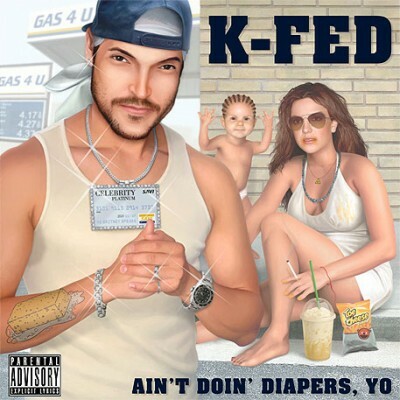 But I thought K-Fed was a diaper changing machine??? omigawd, that is effin' hilarious. That is so hysterical, And true. Wearing warm ups with "Pimp" printed in sparkly lettering at their wedding, barefooted Britney looking like a slob, and K-Fed using his wife's fame to be a rap star, it's so true, that this could actually be a REAL photo!! That's the sad part!! Also LOVE the sponge tattoo on his arm ROFL! HAHAHA the kid's hair, and Britney wearing a kabalah bracelet!!! That kid is so gonna be another K-Fed. Please don't let them produce anymore spawn!! Parental Advisory is right. Teenage girls pay attention, don't end up like this!!! Never marry, and have kids with a loser like this-or you will end up like Britney!!! Britney even has cheeto dust around her mouth. Dis-gust-ing. Where's the mobile home that supposed to be in the background? There sitting in front of the welfare office after KFed bleeds Britney dry.